Not registering for GST when you have reached the threshold. The revenue for GST registration is $75000. For not for profits it is $150000. It is important to pay attention to how this $75000 is reached. The ATO has criteria for recognition of the GST threshold, Generally you need to register for the GST if your current or projected GST threshold is $75000 or above or $150000 for a not for profit organisation. Current Gst turnover: revenue that has gst in it. The calculation excludes input taxed sales, private and out of scope purchases. Projected Gst Turnover: forecast revenues for the current and next 11 months. It does not include out of scope supplies and your input taxed or private supplies. Not getting a tax invoice or keeping sufficient records to claim Gst. If you make a purchase above $75 plus tax for your business and do not get a tax invoice, your purchase is not considered a creditable purchase. You will not be able to claim GST or an input tax credit for it. Not claiming input tax credits on creditable purchases. If you are registered for Gst you participate in the tax regime. You collect gst on the goods you sale and you can claim Gst when you buy goods. If you make a computer purchase of $1100 (including GST) your expense for the computer is $1000 the $100 1/11 of the (purchase price including Gst) is the GST that you can claim on your BAS. For better cash flow keep gst collected in a separate account. Estimate about 10% of your taxable supplies. If you are registered for GST on a quarterly basis you will be expected to pay the GST collected less the Gst you paid for that quarter. Claiming gst without verifying the ABN status of businesses or sole traders you deal with. Use the ABN Lookup tool to verify the registration status of a business if in doubt. A business that is not registered for GST cannot claim a deduction of Gst paid or remit Gst collected. Claiming a tax invoice as fully taxable when it has mixed components. Mixed components means that the purchase or sale has gst and non gst elements. Some of the line items may be gst free or out of scope for Gst. This difference needs to be recorded and GST should not be fully claimed. Improper reporting and recording of Deferrred Gst on BAS. Deferred Gst is the name given to the Gst charged on imports. Instead of paying the tax inclusive amount at the time of purchase importers can enter into the Deferred Gst scheme which allows them to pay for the Gst or get the deduction when they lodge their BAS. Most business pay the GST pre filled at 7A when they file their BAS but forget to claim the GST paid for that period. The Deferred Gst needs to be recorded in your accounting software. If you are not sure how to do this yourself get expert advice from a registered Tax agent or a BAS agent. This is a very common mistake. Lodgement or filing of Gst can either be monthly or quarterly. Your registration letter from the ATO will have the basis of your reporting whether cash or accrual and the reporting period whether monthly or quarterly. Set up your chart of accounts correctly. Most accounting software will allow you to pre assign gst to an accounting code. However you will need to review all the pre assigned gst codes. Some expenses may be assigned a wrong Gst code. Most businesses will make the mistake of coding donation as eligible expenses. Donation are out of scope do not claim an input tax credit. Mixed purchases or supplies are those which may have a gst component and an out of scope component. A popular example in Australia is the vehicle registration payment which has stamp duty (out of scope) as well as a creditable proportion if used for business. Set up a reminder at the end of the quarter to submit and pay Gst. Have a separate bank account to put away money for the payment of your obligations of Superannuation, BAS and Income tax. Separate your business expenses from your non business or private expenses. If you are running a company this is mandatory. Get an accounting software. An accounting software will make gst audits and correction easier. 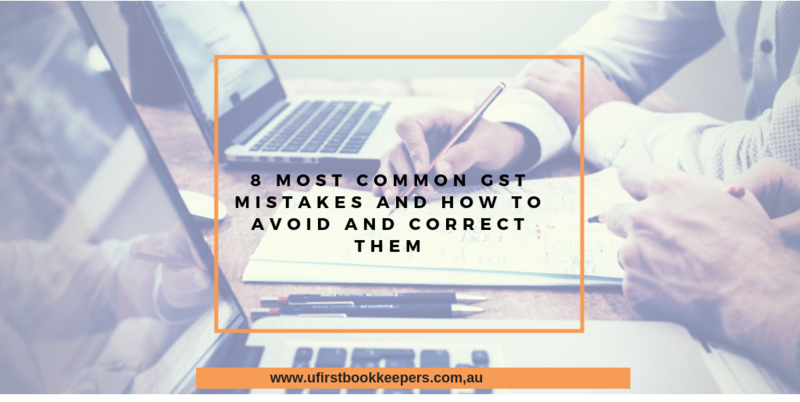 The use of accounting software where the set up has been done correctly can also reduce human error gst mistakes. Mistakes are easier to track and correct with an accounting software. Keep your books current and up to date. Before lodging your BAS put in place procedures that include a sign off on all bank and general ledger reconciliations. This will reduce the probability of under paying or over-claiming gst. If you report on a cash basis your Gst collected is the Gst on the paid Sales for the period and your Gst paid is the Gst on expenses you actually paid. Unless your bank accounts are reconciled the figures in your accounts may be wrong. A bank reconciliation will allow you to catch duplicated payments and underpayments. Get expert help. It may be easy to press the file button from your accounting software but to ensure compliance get a registered tax agent or bas agent to review your GST set up and accounts. If you are registered for Deferred Tax ensure that the set up is correct in your accounts and that your are claiming the input tax credit when you submit your BAS. Contact or check the ATO website for updates on the Gst and how to remain compliant. If you need help with your Gst or need a review of your Gst processes contact us here.